P-3816 A MONUMENTAL VERACRUZ STANDING FIGURE OF A PRIEST CLASSIC PERIOD CA A.D. 450-650. Provenance: Mr. & Mrs. Joseph Goldenberg, Los Angeles, California. Exhibited: The Ethnic Arts Council of Los Angeles, Ancient Art of Veracruz, Los Angeles County Museum of Natural History, February 23 - June 13, 1971, Fig. 29. Published: Hasso von Winning, Pre-Columbian Art of Mexico and Central America, Abrams, New York, 1968, Fig. 247. 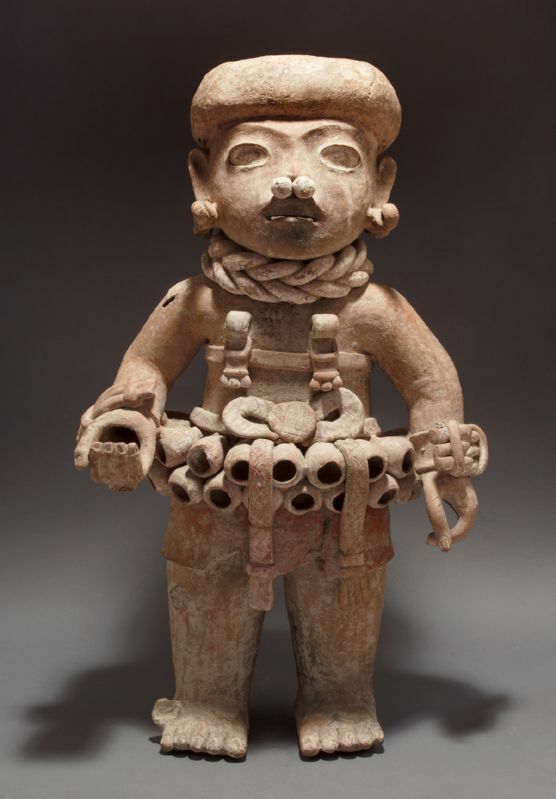 This robust figure, in a stance of boldness, his right hand cupped and reaching outward as if receiving an offering, is heavily adorned with ceremonial trappings consisting of tubular shells cut open on ends to create rattles on a large belt, complex bracelets, multiple ties connecting knotted bows, ornaments upon his chest, thickly braided necklace, earrings, nose adornments, and thick headdress. The eyes portray an intense gaze, as remains of white pigment depict a path of tears running down from the eyes.